Suzanne L. Vinson is a 39 year old artist, mother, and minister living an intentional life toward wholeness, kindhearted listening, and compassionate care. And psst: she's kind of a self-care guru! 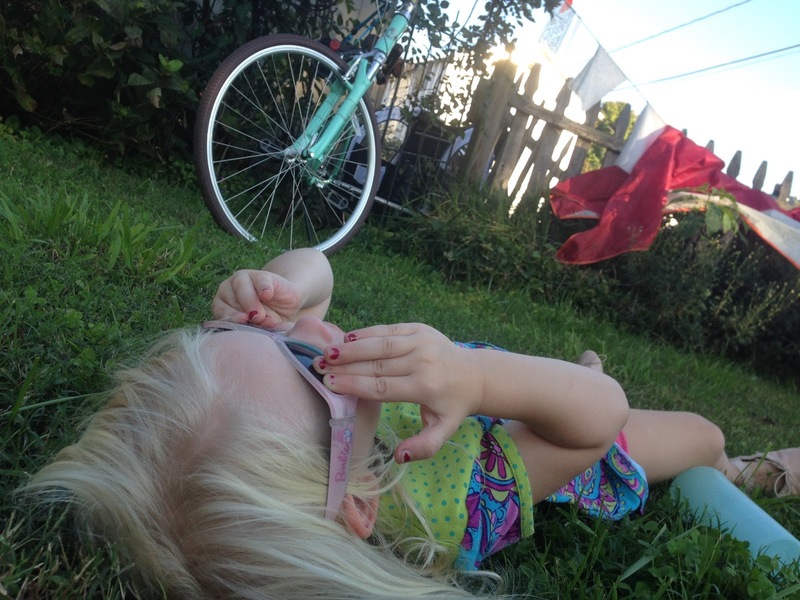 She lives in Richmond Virginia with her husband and her two kids sweet boy (10.75) and sweet pea (3.5). 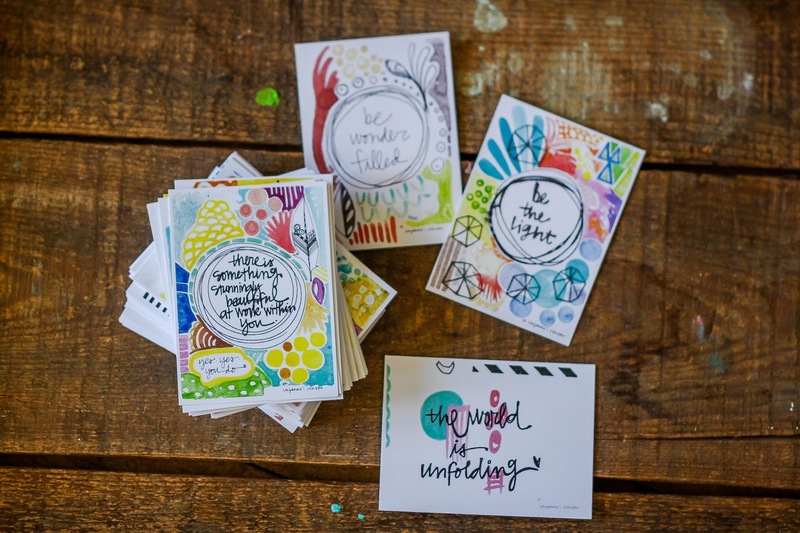 Suzanne creates soul wisdom art, meant to deepen your experience of life, delight, and connection. 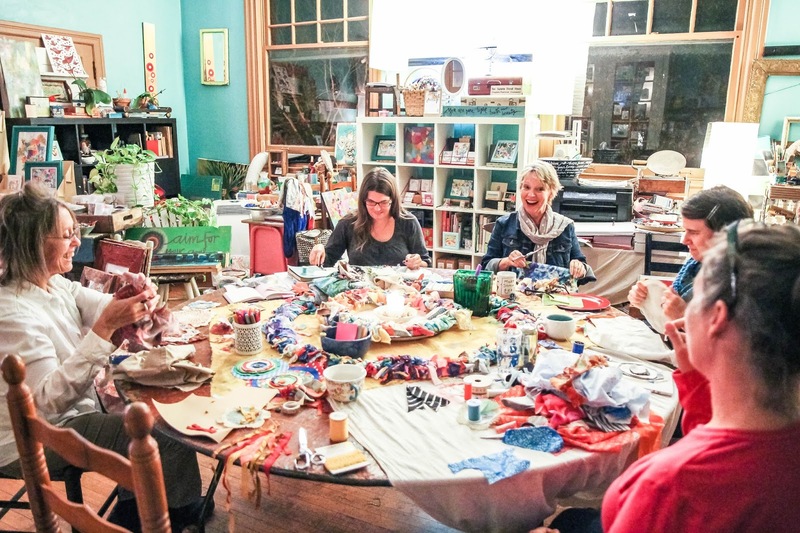 She also leads mini-retreats and gatherings in her studio, as well as travels to lead retreats for organizations, non-profits, and churches. She specializes in working with groups who seek healing, wholeness, and slowing down. Suzanne's work has brought me personal joy and encouragement for many years and I find her voice and images always relevant and inspiring. I deeply admire her life's perspective on mothering and work as a calling, and the inherent vulnerability in entreprenuership as she's grown her business Silver Tree Art while also tending well to her self and family. Grab your coffee and a comfy seat, I am happy to share an intimate glimpse of her lovely and poetic world here with you today. This interview is presented in two parts. Part I is about Suzanne's business and work life flow. Part II will be posted next week and focuses on taking care of the mother's soul. Tell me how you came to your business Silver Tree Aart, and what did you do before? I’ve always been a creator from my earliest days of mudpies, and grass and blooming soups in rain water. I’d paint or color and play, play play. I loved 4H as an avenue of exploring through travel, conversation, and the work of my hands. My education was at a private liberal arts school in MS in business education and a master of education in guidance and counseling, then a master of divinity studies and post grad coursework in bereavement care and chaplaincy. I was a minister in the church in some form from the time I was in my early 20’s. Before that, I babysat for families and sold plants at a nursery, which carried me through college. During my first masters and undergrad, I worked within the laboratory preschool at the college—cooking and teaching in the afternoons. I loved gathering the art supplies and creating projects for the 3, 4, 5 year olds to create. I loved it all. My calling expanded from the time I was 16 until now. Before selling art, I ministered in church, facilitated bereavement groups before moving more into chaplaincy. Then my call reached for a space of my own, and I moved into the studio space so I could welcome groups into my own space rather than relying solely for contract work. I’ve always had a short-term contract outside the studio space to work with folks in group facilitation or chaplaincy. Now I am relying upon the intersection of art and spirituality, the healing work of gathering women together, and showing up for speaking engagements, retreats, and groups and believing something wonderful happens when we’re sharing the same air and space for a period of time. Where does inspiration for your work come from? I am inspired by the shapes and colors in nature, and by the interweaving color stories in my imagination as brush moves across paper. I love, love moss and seed pods. Lichen and leaves and ferns. I love blooms and trees. I love rusty things and barn wood. I process life through my paintbrush. So when I’ve had a trail run or a walk in the neighborhood, the joy of that experience enters the page. When I am feeling fatigued and worn out, I find energy in painting. When I am in a dark space, painting brings me into the light. I see your art everywhere! Are you working all the time and do you think of yourself as a working mama, or how do you characterize the many hats you wear? I’ve worked really, really hard to push myself to see where I can go with my work and in the last year my art has given me so much to be thankful for and so much hope for what can be. My “working life” is so intertwined with every day living and mothering that I’m attending now to separating my time into “working” and living. My definitions follow the seasons of life. Because I went through a really difficult end of 2015 and beginning of 2016 with sickness, I learned I needed additional help, so I recently expanded with in-studio assistants. I continue to better define my “work time” as a part of self care practice, which has made a world of difference. I aim to work hard, work smart, and enjoy family life all at once. How do you make your days work for you, what is the flow of your work/life integration? I appreciate the terrific St. Thomas Day School for the loving care they give my sweet pea 3 half-days a week. She and I have time together, and I use the Y for the childcare during my workouts. I lead an evening mini-retreat in the studio once a month, and additional retreats and gatherings on weekends and during her school days. I love leading my groups, and that benefits all of us. When I am living and loving my time apart from my family honoring my own gifts and call, I am coming home more whole, more me. Motherhood expands my heart; I am stretched and moved beyond measure. Art is my out-breath of expression and in-breath of life. Love carries me deep—filling my well and my cup—allowing my expansion to make me whole. I aim to bless because I feel blessed. I invite others to heal as I’ve been healed. I create beauty through color and word and wonder because I need to see that beauty in the every day. Share why you describe your work as soul work and tell us about #theartofdailyliving. On Instagram and in my writing you’ll see I describe and use the hashtag #theartofdailyliving often, it’s even in my planner/workbook/journal series. I see life as art, a living work of art that is messy and true. Life lands on countertops and tables with bills to pay, ads to recycle, meals to share, stories to tell, and folks to invite near. We’re all in the same boat, though our perception of what’s around us might be different. I choose to see my life through a lens of beauty. Even the dust of our days in the pile at my feet can be beautiful as I sweep. I use the time in my kitchen to deepen my spiritual life. My kitchen window holds my altar with candles ready for lighting, a bowl of paper chain prayers with names written on each, pottery birds and bowls, and green plants. I've noticed that your product lines have richly evolved and expanded over the years, what is the most meaningful product to you, or the most therapeutic as an artist? When I started moving from purely abstract into integrating the wisdom I was hearing, I found my art rooted in a place of growth. My art began to grow as I gave myself permission to use the materials I loved most: watercolors. The art went deeper as I gave myself permission to trust my intuition and combine ink and pencil into my work. If I did all this in secret, I would be fed. I’ve chosen to share through my blog(s) and social media over the years and sharing helps me to expand my heart and my art. I love hearing the stories of others who tell me that I made the piece for them, that the message or image spoke to them in a particular way. I believe that’s part of the art-making. The art is something and the sharing and seeing is another art form. I make art that is made to care for others through rituals of healing, receiving care and love, and to release what is carried that no longer needs to be. My wisdom cards are shared from me to you through social media and in my wee etsy shop and Silver Tree Art studio in Ginter Park. Those soul seeds of wisdom cards are then carried to our tribes in times of loss, celebration, when cancer shows up, and when we need to be reminded we are beautiful and so, so very loved. My candles and sacred strikes are shared in much the same ways. My prints aim to add delight. What is your favorite product series? I love my watercolor dreamscapes. These original watercolors have my heart and I’ve been working on an even larger selection. Each is framed in a turquoise frame I’ve reclaimed and painted using chalk paint, and then sealed with wax. So much of me is in each of these. Your studio is so lovely, how would you describe your workspace and what do you enjoy most about it? My studio is painted “reflection pool” blue with accents of red, brown, and black. There are 5 large windows and windowed closets. You feel like you’re in a tree house, looking out among trees and rooftops. 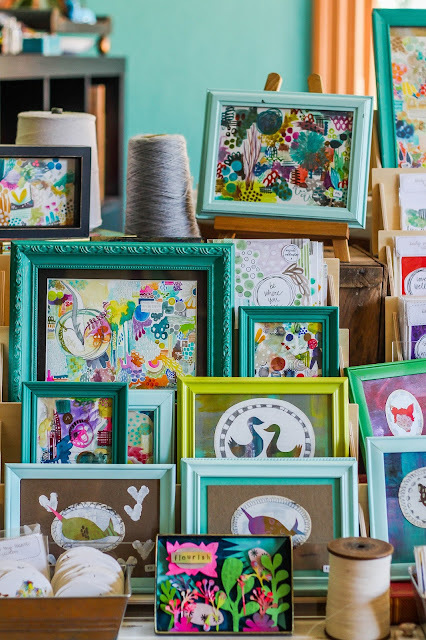 Within the walls of the studio, there are turquoise ball jars filled with buttons, baskets upon baskets of rik rak, ribbon, paper, paints, and fabrics. 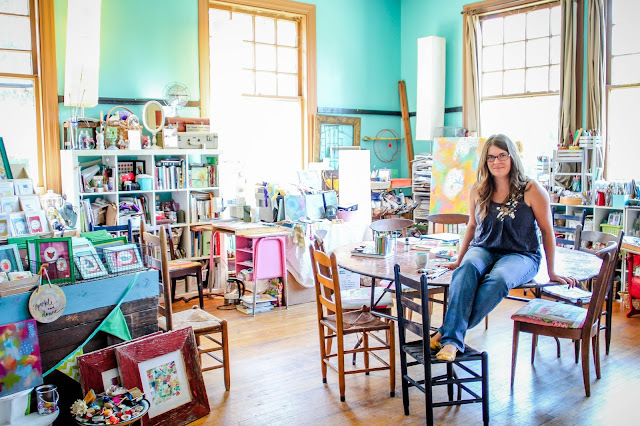 the studio functions as retail space, gathering space, and in-action-artist-studio space. after moving into the space, I had 12 or so women gathered around the studio tables for a studio blessing. Since then the birthday celebrations and mini retreats continue to bless the space. When you walk in, it’s a wonderland of creativity and visual delight. It’s an artist’s treasure box. I dream big. I dream often, setting those hopes and dreams to paper, object, word, art. I put them into flames and let the smoke carry them to the grandmothers. I ask for help. Dreaming big these days, I’m aiming to spread the word about the work I do in the world and tell others why I do what I do and what I believe it can do for the world. I make art to care for my sacred soul. Dreaming bigger :: I am writing a book of prayers. Prayer is such a part of my daily living, and the prayers I extend and share with others connect in a way that enlivens. I’m integrating those prayers into a wider “living liturgy” through my 2017 calendar themes and wisdom. I’ll also share prayers over time with those supporting my endeavor through my Patreon page. I want to share the magic with you and the world. I want my wisdom cards to soar all over the globe, to find their way into all the hands that need them in just the right moment. I aim to help others create rituals for themselves and with their tribes that help them know who they are and who they are becoming. We’ll grow together, each having wings that carry these messages of color and hope and wisdom all around. I’m here and I’m ready to soar. My hope is to write and publish more writing and art, to continue illustrating for published works, to dig deeper and see what’s inside this space that is me as I submit magazine articles and share the unfolding story through books, e-courses, and art. What is your favorite aspect of your offerings at Silver Tree Art? My circles, mini-retreats, and retreats are my soul work and passion, and they bring women ((and sometimes men)) together to weave story and kinship as poetry in color and time. We sit at tables and become healed as we heal one another. We make art when we do not believe we have any artistry within, only to be surprised that we are wildly creative. I’m a magic maker, a soul gypsy healer. I see what you cannot and help you to find that magic within yourself. It’s there. I coax it out with you through my art, gatherings, and presence in your life. It’s dreamy, witnessing your beauty. And I love the miracle of it all. Do you have a favorite quote to live by? Check back for Part II next Monday! 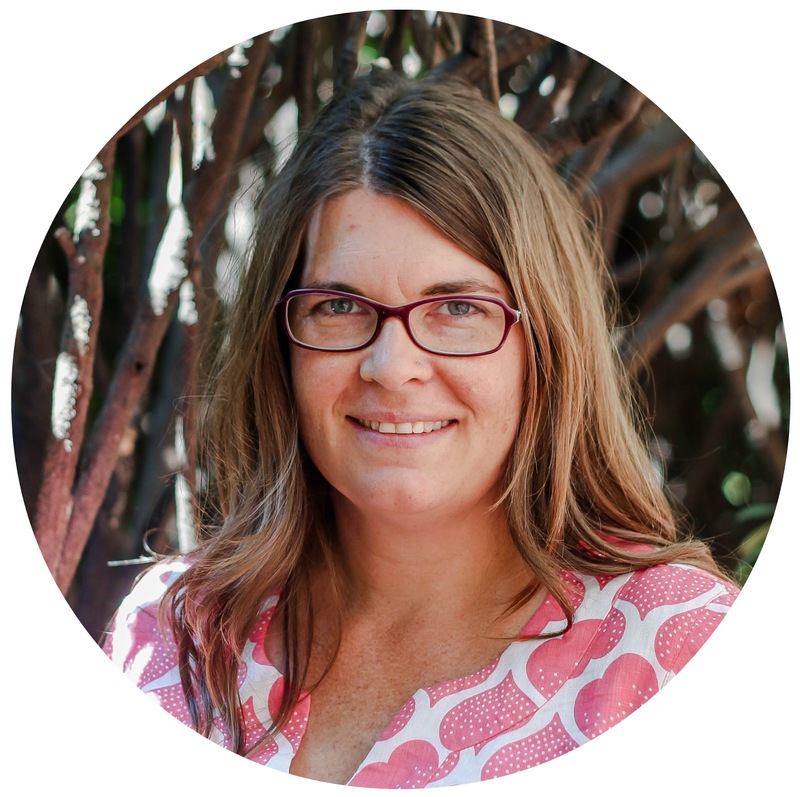 Suzanne will be sharing more wisdom on the topics of mothering and self care. Suzanne offers private "gather your tribe" mini-retreats, birthday celebrations, and day long or overnight retreats for groups. She's available for speaking engagements and workshops as well. Her art is made available through silvertreeart.etsy.com and she has in-studio shopping and pick up available. 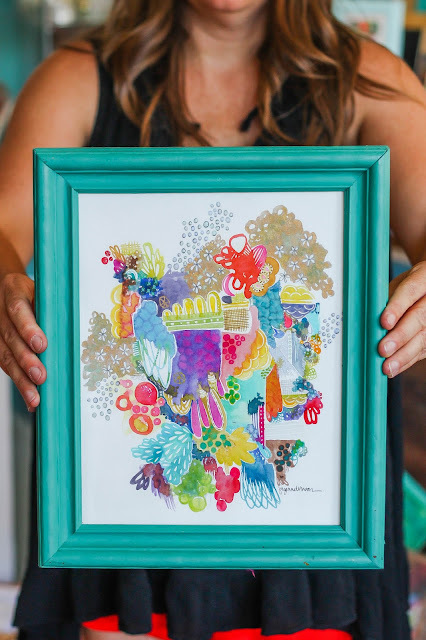 Locally, Orange carries a wide assortment of her work in Carytown, as well as Patina’d Grace, The Valentine Museum Shop, and soon to come Twig in the Northside. She wholesales her art as well and welcomes new shops into the fold. Follow along on Instagram and Facebook. If you are curious to learn more about sharing your story email me at BoldHeartMama@gmail.com. Absolutely stunning artistry, Suzanne! Your story is very inspiring!